Camden is a 3-year-old little boy with a diagnosis of Wilson disease, 15q11.2 chromosome deletion, and cerebellar atrophy/ataxia. Camden can’t walk and often crawls to get from place to place while at home. 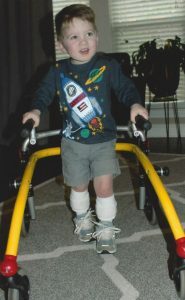 Due to his condition, Camden needs more opportunities to increase his leg strength, and his physical therapist and physician have recommended an adaptive trike for this reason. Camden enjoys just hanging out with his family and is always a happy child, despite his multiple medical issues. He has such a supportive and loving family to encourage him through the tough times. Help Wheelchairs 4 Kids help this little fighter! Please consider sponsoring Camden today!